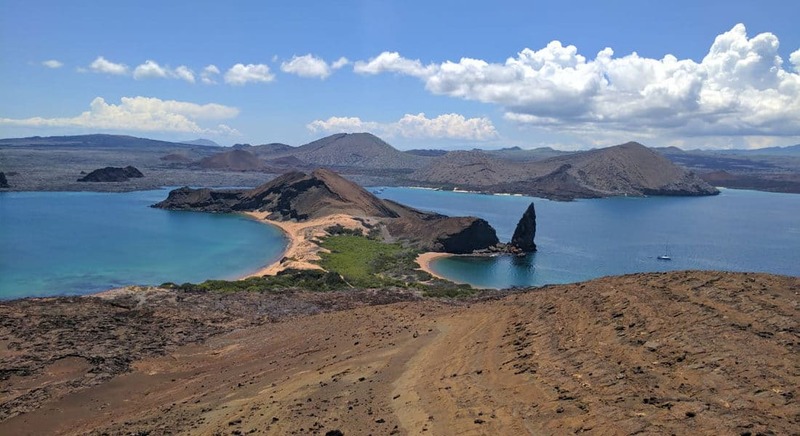 You’ll never be closer to friendly sea lions, marine iguanas, blue-footed bubbies and giant tortoises than at Santa Cruz island. And inside the water… well, that’s a different story! Being the most populated island of the Archipelago, Santa Cruz is very well connected with other islands and natural attractions. So this tour is just perfect if you are on a time-limited journey. Our Wanderbus travel experts have enjoyed this island as much as you will. 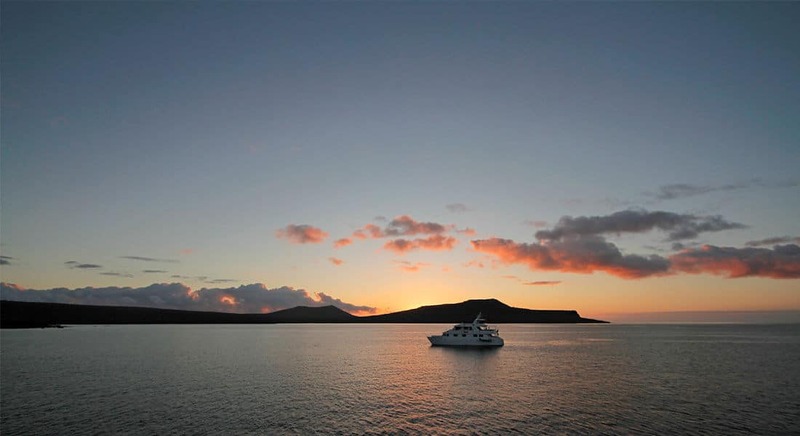 That’s why we’ve teamed up with the best Galapagos’ tour operators. In Santa Cruz, you’ll get to visit different climate zones, from lush Scalesia forest to breathtaking beaches, such as Tortuga Bay, and smaller and picturesque islands, like Bartolomé. So be ready to experience a journey of a lifetime! Either if you are more of a walking person or if you enjoy underwater adventures, you’ll witness evolution firsthand. Check availability: Galapagos tours are limited. Please fill in the form to contact our sales team and check availability within your desired dates and request more information. Our certified bilingual guide will pick you up at Baltra airport to get you transferred to your hotel in Puerto Ayora, at Santa Cruz island. After crossing the Itabaca channel, the official adventure begins! Giant tortoises, lava tunnels and craters will blow your mind in the magical scenery of the Scalesia forest, a tree species endemic to the Archipelago. Enjoy a comforting lunch halfway of our 27-miles drive. Get some rest at your hotel for next day adventures! 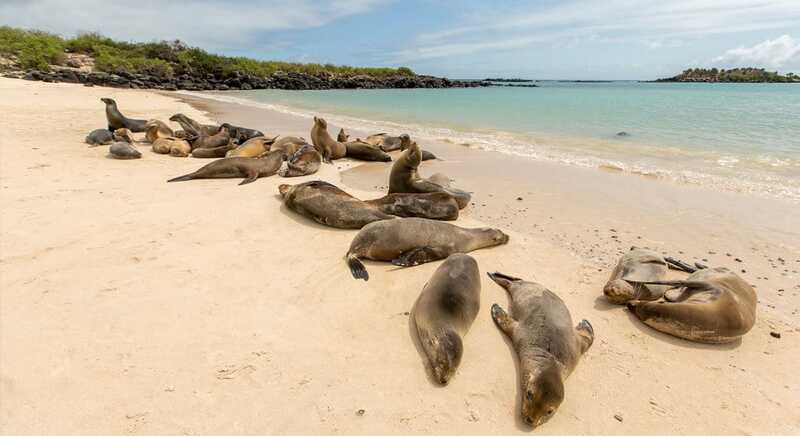 Explore the most populated Galapagos island on your own. Choose from a long but worthy hike to Tortuga Bay, a refreshing swim at Las Grietas or a visit to Las Ninfas mangrove. Experience the day-to-day lifestyle of Puerto Ayora town: spend your afternoon at Charles Darwin Research Station, people watch at its main plaza and dock, or have fun at the seafood market. There are plenty of options to choose from! Depending on the date and availability, you can visit one of the following destinations. Admire the famous landscape, including the pinnacle rock. There’s a chance to see Galapagos penguins! Witness an amazing Pahoehoe lava flow that seems like a never-ending lava sea. Here, you can sunbathe or enjoy snorkeling. Spot land iguanas, giant cactus, Galapagos shearwaters, frigatebirds, Nazca boobies, and lava lizards. Get ready to see white-tip reef sharks. You could even interact with sea lions while you snorkel. See firsthand an island compared to an Alfred Hitchcock’s movie! Meet beautiful bird species, such as male frigate birds and blue-footed boobies. White talcum powder sand, marine iguanas, turquoise water, and the chance to see pink flamingos await you at Las Bachas. Discover amazing sheltered coves, surrounded by a turquoise lagoon. A wet landing on a sandy white beach in Playa Escondida will contact you with one of the many sea lion colonies. 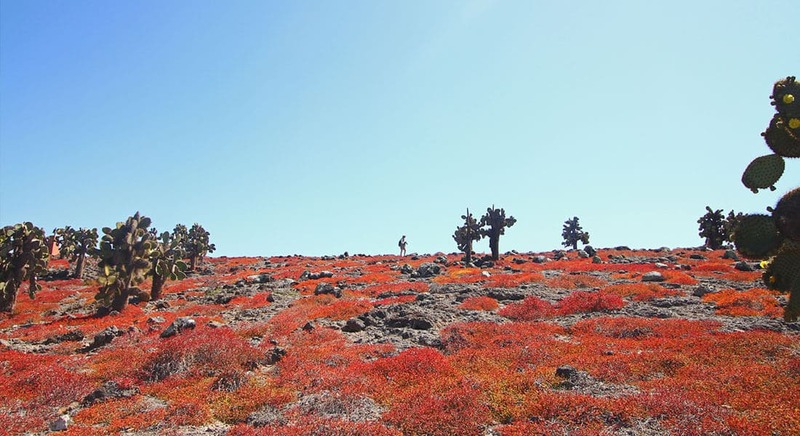 The giant prickly pear cactus found here live up to their name with tree-sized trunks. After breakfast, you’ll be transferred to the Itabaca channel. This drive will take approximately 50 minutes. Upon arrival to the Itabaca Channel, you’ll take a short 10-minute ride on a ferry to Baltra, followed by a 5-minute bus drive to the airport for your flight back to Quito or Guayaquil. Included: Transportation from Puerto Ayora to Itabaca channel. Keep in mind that you are in the equator, so be sure to bring a wide-brimmed hat and sunscreen. Sturdy hiking shoes and flip-flops or sandals are a must to guarantee comfort to your feet. Of course, don’t forget your swimming gear, refillable water bottle, binoculars, a small backpack, and your camera (or a GoPro). Tipping to the staff is at the discretion of our guests. Tips for the guides are usually given in person. The warmest months are from January to May; occasional short downpours are expected. It gets cooler and drier from June to December; seas get choppy due to Humboldt current. Immunizations are not required to visit the Archipelago. It is advisable, however, to consult your doctor or physician before your trip due to physical activity. We recommend you to bring motion-sickness pills for the navigable tours. Plane tickets are not included in the tour.